The seasons of life ebb and flow in a way that teaches us to be patient and wait. Sometimes we have lean - dry times and other times we have vibrant growing times. It doesn't mean that something is wrong or that we have been forgotten, or that we are doing it all right and are the "blessed" ones. For the Lord rains down on the just and the unjust alike. He cares for everyone alike and he longs to see them find fullness and renewal in their lives. 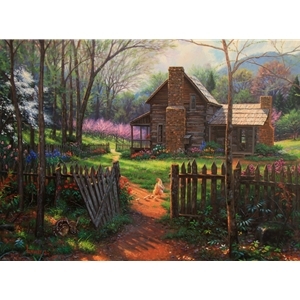 In Welcome Spring, I've depicted the exciting time of life when the fragrance of life is wonderful, too much to contain, and the beauty spills over for all to see. The excitement of new birth and buds awaken the senses and make us feel alive, and give us the promise that the cold winters of our lives will not always be. There is such hope and expectation in the spring and I hope this painting stirs up that longing in your heart to see things grow and blossom. Go ahead and plant the seeds of acceptance with your estranged son, or wayward daughter; dig up the weeds of resentment and jealousy with someone you have grown to dislike and replace them with the fragrant flowers of forgiveness and love. It is a time for renewal.